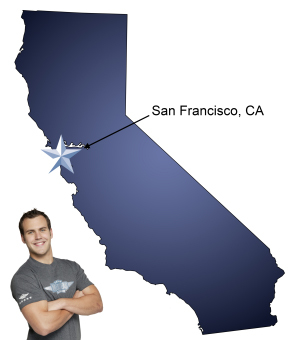 Meathead Movers is here to take care of the heavy lifting for you on your move to San Francisco. Our clean-cut student athlete movers are ready to get you safely settled into your new San Francisco home. Do you need San Francisco movers to relocate you to that perfect Victorian home in Pacific Heights, that sleek South of Market Bay-view condo, or anywhere else in the City by the Bay? Well if you do, you can trust Meathead Movers to make your relocation an efficient, hassle-free and cost-effective experience. Our student athlete movers—from local colleges such as the City College of San Francisco and San Francisco State—are motivated and dedicated to ensuring that your move goes smoothly. With a breakage rate six times less than industry standard and some of the highest customer satisfaction rates, Meathead Movers is a step above the rest. We take the stress out of your move, that way you can relax and spend more time getting to know your new neighborhood. Being right by the coast, San Francisco has a nice temperate climate that usually never gets hotter than the mid 70’s, even during the heat of mid-summer! Which means it’s never too hot to explore the big city. Just be sure to bring a jacket, because San Francisco’s morning fog can be a bit chilly. Just as cool as the weather, is the city’s unique culture. It’s home to world-class opera, symphony, and live theater. Just check out anyone of the city’s highly esteemed art institutions such as the de Young Museum, the San Francisco Legion of Honor, San Francisco Modern Art Museum and the Asian Art Museum. In addition to beautiful art, people can also admire the city’s intricate architecture. The famous Transamerica Pyramid, Coit Tower, Golden Gate Bridge, the Sony Metreon, the Palace of Honor, and the windmill of Golden Gate Park are all a treat for the senses. San Francisco is also home to a live music scene that rivals that of any city anywhere. Jazz, blues, rock and roll, country, punk, alternative—whatever your taste, you’ll find someone playing it somewhere just about any night. Sports lovers can enjoy Giants and 49ers games, or take a short BART ride to Oakland for Raiders and A’s games. Even long-time residents love to play tourist here. It’s not hard to with locations like Alcatraz, the Presidio, AT&T Park, Fisherman’s Wharf, the Embarcadero, Union Square, Mission District, Market Street, the Castro, the Cliff House, and Chinatown all within the city. There’s just so much to see and explore, one could spend a lifetime experiencing it all. And that’s just San Francisco. The greater Bay Area—including Oakland, Berkeley, the Peninsula and upscale Marin County—is alive with recreational, cultural and social opportunities. No matter if you are leaving, arriving or just relocating in the San Francisco area, Meathead Movers’ team of strong, clean cut, local college student-athletes is the perfect choice. Our associates are professionally trained and certified, that way you can be assured that your household possessions are in good hands with us. We specializes in local, long-distance, and commercial moves to, from, and within Emeryville. We also provide reliable packing, storage, on-site relocations, and our distinctive moving concierge service, which connects you with local service providers. Moving to San Francisco? Here are some helpful resources. View more San Francisco resources. Fast, polite, thoughtful...very easy during a stressful time! Very efficient and thorough. Staff also very professional and helpful. My initial experience with Jennifer during the quoting process was great and accommodating. When the movers came, the person in charge, Nate, did not want to add anything that wasn't on the agreed upon list with the explanation that it was in some way illegal, it would make them overweight, and would not be reflected on some original shipping list in case he should be pulled over by the police putting him in legal jeopardy? This explanation rung hollow to me, maybe I do not know the transportation laws, but it seemed to me to be a strangely legalistic answer to my request. I was willing to pay extra, but this didn't seem to be an option, and I got the distinct impression that Nate could not be bothered by any more inquiries. The items in question were a couple of shoe racks, 3 plastic bins that fit under a bed for blankets and such, and a few other small items. When the furniture was delivered, someone instructed my roommate to stay down by the truck to watch it so that no one stole anything. He willingly did this, to his credit, but this was not his job at all, and I would have preferred he stayed in the apartment and directed the movers because the furniture, which was a lot for the size of the space, was put in every which way. I paid $3300 and a $300 tip to the movers (in advance) and I am still trying to de-Tetris my apartment. Other than these issues, the movers Sal, Nate, and the other man, did do a quick and clean moving job. I give you this honest feedback, Meathead Movers, in order to improve your service and instruct your employees. Staff members were very organized and responsive both on the phone and in person. I thought two people would not be enough for the job, but it was finished in almost no time, very impressive! And nothing was broken, which is especially impressive given that my husband packed porcelain and glass items in the same box as metal tools with NO padding at all (eek).